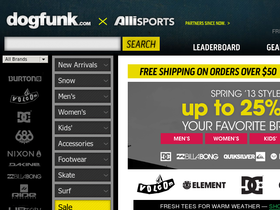 Alli Sports, online at AlliSports.com, is the ultimate source for action sports. Alli Sports offers equipment and apparel for all types of action sports. Skate, BMX, snowboard, freeski, wake, and even moto. Alli Sports offers a huge selection of men’s and women’s shoes, and men’s and women’s clothing including tops, bottoms, outwear and accessories. Find quality skateboards, snowboards, and all the gear to go with it. Alli Sports offers popular brands including Altamont, Burton, Brixton, DC Shoes, Emerica, eS, Fallen, Forum, Volcom, Thirty Two, Supra, Kr3w, and so much more. You’ll be set for whatever action sport it is you love. So check out Alli Sports and remember to stop by RetailSteal first to find the best Alli Sports coupon codes, Alli Sports promotions, and Alli Sports discounts. Alli Sports offers free standard shipping on orders of $79 or more. Expedited shipping is available. International shipping is available. See website for full details, exclusions may apply. Act now and take advantage of a 15% discount sitewide with this coupon code from Alli Sports. Enjoy free shipping from Alli Sports on any order of $79 or more. Shop the outlet section at Alli Sports and save up to 50% on brands like Emerica, Nike, Altamont, Burton, and more. Click here to shop. Right now at Alli Sports, save up to 50% on boardshorts and shorts from brands like Element, RVCA, Volcom, and more. Click here. Sign up for Alli Sports' email list and receive 10% savings on your first purchase. Shop online at AlliSports.com and enjoy up to 50% off a wide range of apparel and gear with outlet discounts. Receive a free 2011 Alli Shop calendar with any online order at Alli Sports. Click link to save.